They have won. With help from Kiera, Fire Mage, the shapeshifting slaves of Fairbanks have broken their chains, and then lifted her to govern their city. But Kiera and her co-rulers struggle to integrate the former slaves and the remaining mages. A worse threat outside Fairbanks waits to fracture the fragile peace. Governor Vrishka, the Skani Water Mage of Barrow, has marched an army from the North, and sends terms: Surrender Fairbanks and restore the Skani mages to rule, or he will raze the city and kill all the shifters. He gifts them ten turns of the sun to make their decision. Halfway through the armistice a devastating blow steals all hope for Fairbanks’ victory, and crushes Kiera’s heart. Can she summon the strength to transcend her grief and find a way to defeat Vrishka? If so, what price is she willing to pay? Five days—and a city—await her decision. Welcome to the Alternate Alaska, where those born with the power to control the elements rule as nobility over those who cannot. For now. is to master her own magic and the art of leadership in war at breakneck speed. 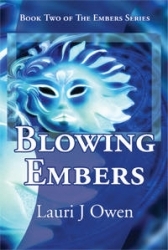 Vivid characters, intricate world building and sharp twists and turns of plot make Blowing Embers an absorbing and satisfying tale." alternate Alaska will stay with you long after you reach the last page." "In Fallen Embers, Ms. Owen created a world that readers will never forget. In Blowing Embers, Book Two in this extraordinary tale, the stakes are even higher. With nothing short of her entire future on the line, Kiera will either step up to her role or the fate of her entire kingdom will end before it has even begun. "Dare to step once more into Lauri J Owen's alternate Alaska, and become ensnared in the mire of politics, dark magic and a sorrow that will rip your heart in two. Take your stand against the overwhelming forces on a whirlwind march that seems to lead only to deeper despair and loss, to stinking pits where death is the only escape and ask yourself, as does Kiera: Do I have the strength to carry on? For only strength and love can save her now, and those who follow her for the sake of freedom from slavery, even when it seems all hope is lost." Book 1 of The Embers Series. A dog's attack sends a fiesty attorney and her nephew catapulting into an alternate Alaska, where those who control the elements rule as nobility over the indigenous shapeshifters who cannot. Adobe PDF ebook.